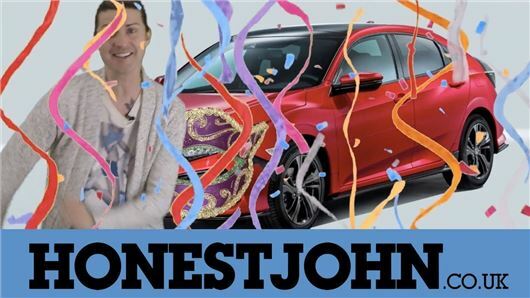 VIDEO: Honda Civic review - a party on wheels? It's fair to say that the new Honda Civic doesn't photograph well, but beyond that is an exceptionally practical family hatchback that's also great to drive. Here's how Mark got on with it. If you're reading this and you haven't yet subscribed to our YouTube channel, please do us a favour and click here to do so. All it means is you'll get a notification when we do a new video. Thanks. Professional Geordie thinks he's an entertainer. Personally I don't think its such good value, as the £18.5k starting price for the 1 ltr SE (not quick at 0-60 in 11sec) is, for example, £1500 more than the similarly-specced (manual A/C admitedly) Mazda3 SE 1.5 petrol hatch, and the much quicker 2 ltr SE-L Nav (0-60 in 8.8sec on the saloon, which has a boot space nearer in size to the Civic than the hatch) with climate control and lots of other goodies is a list price of £19.5k, but unlike with the Honda (probably little dealer discounts and only one well-priced deal [18% off] with the brokers, but it ties you into a 9.5% APR PCP deal, meaning you pay a lot more), you can get many deals from brokers for around 20% off the Mazda3 WITHOUT having to pay extra for a tied-in PCP deal (just a standard 'upfront cash' purchase). The Mazda3 is better handling (and had the 'amazing' multi-link rear suspension 13 years ago, as it does in my 11yo 3) and rides fine on the 16in tyres of the SE and SE-L variants (not so much on the 18in-shod Sport). I'm sure the Civic in 1.5T guise is quicker (especially on mid-speed acceleration) in everyday driving than the Mazda3 2.0, a bit like the Golf in 1.4 TSi format (even the 122PS version), but to get that extra performance and roughly the same interior/toys you have to spend (including discounts) probably £5-7k more, which to me a hell of a lot for a bit more poke and a 0-60 time of 0.5 sec less. The Civic is a good car (other than the exterior looks), but I think that its over-priced for what it is and in petrol form (deisels are another matter entirely) are no more reliable, in the short or long-term, than the Mazda3. It may depreciate less (though not recouping £5k+ over a 3-5 year period of ownership from new) than the Mazda3, but in the main, most Civic owners keep them for a good amount of time, making the depreciation issue moot, and besides, servicing at Honda dealers is generally more expensive (customer care with Honda, is, on average, probably on the whole better) than at Mazda ones. If they dropped their prices by about 10-12% and smoothed out those exterior 'modded' looks, I might've considered going for one. The Mazda is by no means perfect either, but if I had to choose at present, I think its still the best compromise (for me at least) on offer at the moment, balancing driving experience, comfort, reliability and costs (new and on-going), especially for a longer term buy. Similarly with the Golf, to me they are 20% over-priced (lower spec than the Mazda and Civic for the money), generally less reliable (the latest 1.4 and 1.5 TSi engines are close on that score to the Mazda and Honda, but the car generally still has many issues/niggles with other components which are well documented on HJ and aren't easily fixed over the long term, plus I don't rate their customer service so much). I think the SEAT Leon is a much better alternative at present, as they are much more keenly priced (sometimes better deals on their 1.4 150 ACT FR than the slower Mazda3 std 2ltr SEl-Nav), taking into account the lower reliability (outside the engine itself) and customer care level of the VAG-branded SEATs.